On Pinterest? You Could Win $500 from Saveology! To be eligible you'll need to have a Pinterest account. 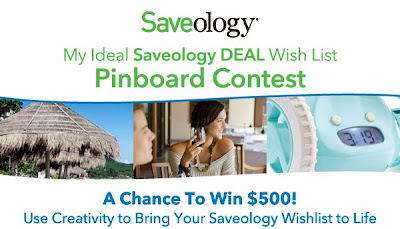 Create a Pinterest board titled “My Ideal Saveology Deal Wish List.” Fill the board with at least 10 pins, where at least 1 pin is a Saveology Deal & 1 pin is a Saveology Destination. Get creative with other pins of things you wish we had deals on. All pins must be captioned with a catchy tagline & hashtagged with #Saveology and #Wishlist. Enter the contest by posting a link to your board in the comments section of this pin. Click here for more info, and good luck!